The most exciting technique available to anyone who likes embroidery, is that of Goldwork. The skill needed to master the work and to achieve all the possibilities with the best effect, takes years of practice and dedication. The Goldwork Guild was formed in 2004 by Janice Williams to keep the art alive in the 21st century, to provide a knowledge base for those into the future and as a way of passing knowledge and information to all who are interested in this fascinating work. It promotes the art of goldwork and presents information for all those who would like to learn more about this beautiful art form. Janice, a graduate of the Royal School of Needlework has spent a lifetime dedicated to lecturing and teaching needlework and embroidery and more especially goldwork. Such is her passion to keep metal thread work alive she continues to teach, advise, inspire, and throughout the year runs a monthly working group. The Goldwork Guild produces magazines twice a year and these, both past and present, are available to purchase. They are filled with various interesting articles, techniques, tips, equipment and reference material. The Guild also organises visits to interesting venues, country houses and places to see embroideries not normally on display. Input from others is most welcome and this will eventually provide a library of accumulated notes and any unpublished research. Gold has always been the symbol of wealth, affluence and status, no matter where one is living in the world. It has captured human attention since time immemorial, and being the noblest of metals, gold has been utilised in many applications. 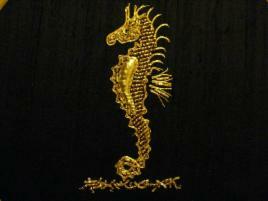 Throughout history, goldwork has been used in a variety of ways in fabric decoration. 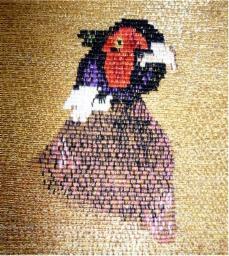 It can be used in embroidery and appliqué, weaving variegated patterns made luxurious in gold thread. Shimmering patterns can be embroidered using gold and silver thread that may be interspersed with silk threads and precious stones. These materials convey opulence, distinction and power. Dating back almost 2000 years, only royals, nobility, and those of great wealth could afford such magnificence in garments, robes, domestic furnishings and religious embroidery. Whilst the history of metal thread embroidery goes back so far into the past that its origins are lost, it’s widely believed that goldwork embroidery originated in China. The craft then spread to Asia, Persia, India, Middle East, and the ancient civilisations of Assyria, Babylonia, and Egypt. It also reached North Africa, Spain, Italy and then came to Western Europe, Great Britain, Scandinavia and North America. The specialism encompasses many techniques and materials. As well as pure gold and silver, the embroiderer now has a choice of relatively inexpensive imitation gold, silver and copper threads to work with, along with a myriad array of coloured metal threads, all in many different sizes. This art form is particularly prized for the way the light plays on it, which is influenced not just by the richness of the metal thread used, but also by the variety of metal threads available and the techniques used. Ceremonial, military and religious attire is still adorned with the richness of gold embroidery. The design for military pieces however, is very much constrained by tradition. Goldwork, that enhances domestic, religious and ceremonial textiles, is still being traditionally worked today. Many other techniques and materials can be combined with goldwork to create exciting contemporary pieces.